Yield: Serves 4 - 5. Lobster mushroom soup boasts in flavour that will leave you wanting seconds. 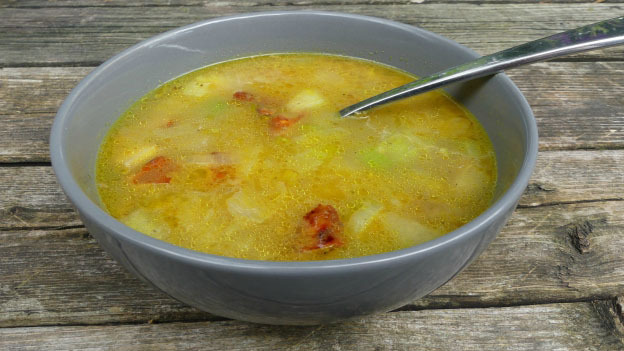 Loaded with vitamins D and B-complex this healthy soup will become a favourite. Bring soup stock to slow boil. Add carrots and celery then turn stove heat to medium. Saute onions in butter 5 minutes. Add to soup mixture. Add more butter to the frying pan then saute the lobster mushrooms for 5 to 8 minutes. Add to the soup. Next, add the rice and turmeric, bring to a simmer. Season with sea salt and pepper to taste. Let simmer 30 to 45 minutes. Serve. If desired, add a dash of your favourite hot sauce.